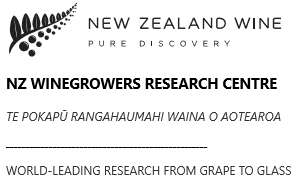 The New Zealand Winegrowers Research Center (NZWRC) was established in 2017 as a part od the New Zealand government’s Regional Research Institute (RRI) Initiative. Our mission is to provide world-leading research from grape to glass. The NZWRC will provide cutting-edge science, research and innovation to benefit New Zealand’s entire wine industry, and its key stakeholders. Regionally based in Marlborough – New Zealand’s largest wine-growing region – the Centre will have a national focus, and global reach, providing world-leading research and innovation for commercial grape and wine production. One of our core research themes is “Protecting our Terroir, Provenance and Eco-systems”. Central to this is our research program “Adaptation techniques to manage the impact of climate change for NZ grape and wine production”. As part of this climate change program we are forming partnerships with other organisations in the spirit of collaboration, working towards a common goal. Soil4Wine is a LIFE+ project aimed at improving soil management in vineyard ecosystem and at defining tools and methodologies to support soil’s functions and ecosystem services. Outcomes of the actions proposed in demonstration farms located in protected areas, will help farmers in the evaluation of soil quality in them vineyards in order to enhance and support soil ecosystem functions. Project results can also give information useful to define future policy decisions. Vilafranca del Penedès is responsible for the Vineyards Heat project with Life program supported by the European Commission. The aim is to promote the use of leftover biomass from vine pruning of the Penedès to generate decentralized bioenergy, by reducing CO2 emissions, bringing down energy bills and creating work places by implementing the virtuous Circle of Vine (VVC). The VVC makes profit of vineyards pruning to generate heat and cold for wineries. This VVC involves all actors of the biomass value chain: biomass suppliers from vineyards, collectors of biomass, and consumers of energy, with the supervision of an institutional guarantor: the municipality of Vilafranca. Thus, the project aims to demonstrate the feasibility of the Virtuous Circle of Vine as local strategy to mitigate the effects of climate change, while allowing the wine sector companies and cava be more competitive by helping to achieve low carbon emission economy area and high added value in the the DO Penedès region. The overall objective of LIFE VITISOM is to promote a sustainable vineyard soil management, through the development, testing and scale-up of a cost-effective innovative technology for vineyard organic fertilization. AgriAdapt is a European project sponsored by the LIFE programme of the European Union. It will demonstrate how sustainable adaptation measures can help livestock, arable and permanent crop farms become more climate resilient. It will also explore the other positive environmental benefits of these measures. Partners will develop actions in close collaboration with farmers, experts, administrations, agricultural schools and private entities in order to obtain transferrable results. Project implementation is organized in accordance with the four main EU Climate Risk Regions: Southern Europe, Western Europe, Central Europe and Northern Europe. Combining innovative techniques and genetic for a sustainable European wine industry, this is the objective of the InnoVine European collaborative project financed by the European Union. From 2013 to 2016, a consortium of 27 partners involved more than 100 researchers and wine producers from 7 European countries. Theirs results will be presented during the project final symposiumon 16 and 17 November 2016 in Toulouse, France.